As a dog trainer, I hear this all too often. So, why it is some dogs hate crates and others love them? I think a lot of it has to do with the way the crate, or confinement in general, is introduced to the dog. For instance, the vast majority of pet store puppies are born in a cage, raised in a cage, shipped across the country in a cage, and displayed in a cage until they become someone’s pet. After living the first part of their lives being perpetually caged, no wonder they’ve formed a negative association with crates, no matter how comfortable we make them. In other instances, I think that many owners use the crate only when they are leaving the house and need a place to put the dog. The dog comes to associate being crated with being left alone, and possible bored, for long periods of time. I also believe that there are some dogs, just like some humans, that become overly anxious in small spaces for reasons we will probably never understand. However, I think these dogs are in the minority. Then there’s the dog that has figured out that if he barks and whines long enough someone will let him out of the crate. So, what do we do with the crate-hating dogs? One option is to find another method of confining the dog. Tethers can work to keep a dog nearby, and in sight, when we are home and busy working on the computer or watching TV. We can also keep the dog leashed and tied to us so he follows us around everywhere. When we leave the house, a laundry room, or other dog proof space, can be used for confinement. This option raises the question though; do all dogs have to be crate trained? No, but having a dog that can be comfortable confined to a crate makes things less stressful for both dog and owner. Think about if your dog ever gets sick and has to stay in the hospital, or if you ever have to fly with your dog, or board your dog, he will have to be crated. So, the other option is to teach your dog to like his crate. Here’s how – For the first week, either take the door off the crate or bungee it open. Feed your dog his meals in the crate; throw treats and his favorite toys in the crate. 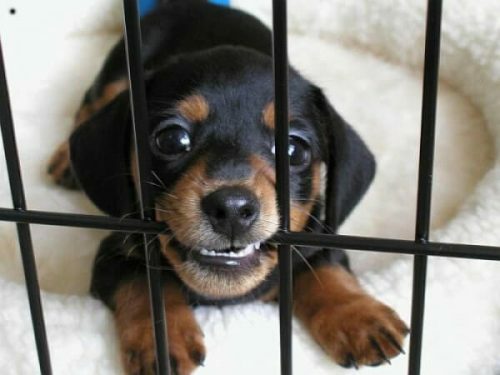 Let your dog go into and out of the crate as he pleases with no threat that the door will close. Don’t make a big deal out of the crate, or your dog for going into and out of it; “whatever dude it’s just a crate”! Once your dog is comfortable with this step (and it may take more than a week), toss your dog’s absolute favorite treat into the crate and when he goes in to get it close the door behind him for a split second, then open it and let him out. Gradually begin to close the crate door for longer periods of time, but vary the routine so that sometimes the door closes and sometimes it doesn’t. Continue this until you can work your dog up to 30 minutes in the crate before confining him and leaving the house. Make the first outing a short one, and be very casual about leaving and returning – remember the crate is no big deal! Keep practicing this; again, vary the routine so the length of time you’re gone is not predictable for your dog. Most importantly, be patient with your dog, remember, you’re not just changing his behavior; you’re changing his emotional state about his crate.